Strike together to bring down the Tories! Coordinated strikes on Thursday 4 October mark a massive step up in the battle to unionise workers in fast food and hospitality. 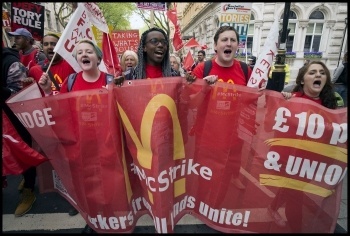 Britain's contribution to the latest global day of action is a joint strike by members of bakers' union BFAWU and general union Unite at McDonald's, Wetherspoon and TGI Fridays. They will also be joined by couriers at Uber Eats and other gig economy companies in the IWW, IWGB and GMB unions . This is the biggest show of strength by precarious workers in this country to date, and their message is the same: we are workers, and we deserve to be treated properly. It is already giving other workers the confidence to fight. On 30 September, workers in the Ivy House pub in south London walked out in solidarity with their workmates who have been sacked. They are all fighting for a minimum wage of £10 an hour with no age exemptions. In London, the wage recognised as the bare minimum needed to live is actually now £10.20 an hour. Yet the government's national minimum wage is £7.83 if you're over 25, £5.90 if you're 18 to 20 - or as little as £3.70 for apprentices! This is nowhere near enough to survive at a time when inflation is nearly 4%. No wonder many workers need two or three jobs to get by. But life is great if you're part of the super-rich. The richest eight people in the world have the same wealth as the poorest 3.6 billion! This is the reality of capitalism - a system controlled by big businesses to maximise their profits at workers' expense. Workers do all the work that makes this money - profit is the unpaid labour of workers, spirited away by the corporations. McDonald's workers know full well that they are only paid a fraction of the value of the meals they produce and serve up. The Socialist Party stands for socialism: a society where the main levers of the economy are nationalised under democratic workers' control and management, so that production is democratically planned in the interests of the majority of people. This is the only way that workers can be guaranteed a real living wage, decent jobs and affordable housing. Striking workers are also demanding an end to zero-hour contracts - tying workers to the job, or their mobile phone, but only getting paid when it suits the boss. The employers call it 'flexible' - but it enshrines insecurity for their benefit, not ours. The gig economy is a further step back to Victorian times. But the Uber Eats couriers, like those at Deliveroo previously, have showed that super-exploited workers are up for the fight - blockading the company to demand that their already-too-low rates aren't cut further. These strikes show that these workers, often young and in many cases migrant, understand that being organised in a union is the best way to protect yourself from the bosses' attacks and fight for decent wages and conditions. These developments recall when unions first became mass organisations over a hundred years ago. Then, as now, if a fighting lead is given, workers can flood into the unions. But the unions can give an even bigger lead right now, with the Tories weak and divided. They should take action together on all the issues that face workers: pay, pensions, privatisation and austerity. They could mobilise the union movement - still potentially the most powerful force in society at six million members - to demand a general election to force the Tories out. The potential is clear in the many strikes that are taking place every week. University workers are balloting nationally on pay, and school workers are consulting over action too. The RMT union is into its third year of action to keep guards on trains. Prison officers walked out two weeks ago against the cuts. Even head teachers demonstrated on 28 October over the school funding crisis. We must bring all these fights together. A general election would give us the opportunity to get rid of the Tories and elect a Labour government led by Jeremy Corbyn. His manifesto in last year's snap election gave a glimpse of a future worth fighting for - £10 an hour, abolishing tuition fees and renationalising privatised companies. The capitalist establishment and big business, the Tories and their Blairite agents in Labour, are all concerned that a Corbyn government could open up workers' horizons, pushing it further to the left. But workers need to be mobilised - both to fight for an anti-austerity government, and to face down the inevitable resistance from the bosses. Join us in that fight.